At the 2016 Sperry Charleston Race Week, a number of boats in the Melges 24 and J/70 fleets proved you don’t have to be a pro to be competitive. 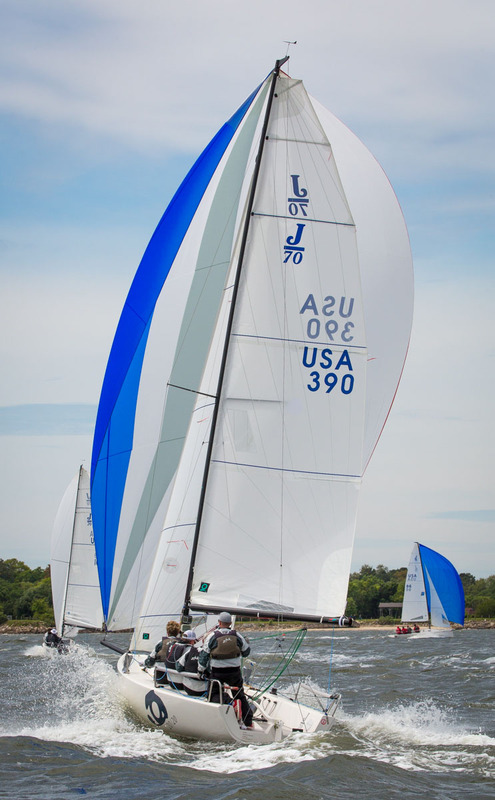 One of the most unique aspects of sailing is that amateur teams get to test their chops against the pros on a regular basis in fleets like that of the Melges 24 and J/70. But for some newcomers, that can be a burden as much as a blessing. More than 200 boats of all skill levels gathered this sprint at the 2016 Sperry Charleston Race Week. We talked to two top Corinthian teams, Dr. John Arendshorst who owns the J/70 20/20 and siblings and boat owners Megan and Hunter Ratliff of the Melges 24 Decorum, to find out their secrets for success. Arendshorst says he’s been fortunate to gather a group of good friends who are also good sailors from his home area of Macatawa Bay, MI. “There’s a great group of people that find time to want to sail. If you can at least keep the nucleus of the group together for most of your events it helps a lot,” he says. The Ratliff’s echo that sentiment. “We like to keep people on the boat that are fun, and we have a good time together,” says Megan. Quantum is constantly working to update its tuning guides for the various one-design boats. “The tuning guide is a good starting point. As you improve and get to know the boat, you can make small adjustments for how you like to sail, how heavy your crew is, and other variables,” Arendshorst says. “What’s nice about the tuning guide is that it’s pretty easy to follow. It’s almost plug and play. And for all the fine-tuning, [Quantum’s] Marty Kullman, Scott Nixon, and Chris Rast have been very helpful. It’s nice to have access to experts in the class,” says Hunter Ratliff. It can be intimidating to come into a big fleet like the J/70 or the Melges 24 and face dozens of boats on the starting line—there were 67 J/70s in Charleston this year—many of them with professional sailors on board. But the opportunity to sail against that caliber of crew can really push you to get better faster. “It helps so much to sail against the top guys because it really pushes you to develop as a team at a faster rate,” says Hunter. If you’ve just bought a J/70 or a Melges 24, you probably did so anticipating a wild downwind ride, and you’re sure not to be disappointed! But sailing a sport boat in big breeze becomes less about tactics and more about boat handling. “At 25 knots, it’s all about keeping the boat upright, so having a crew with good choreography is a real asset,” says Arendshorst. The best way to improve your crew choreography is to spend as much time in the boat as possible, sailing in a variety of conditions. Since they’ve bought their boats, both the Ratliff’s and Arendshorst have sailed the summer and circuits in the Midwest and south. While we can’t all spend 250 days per year on the water, we can all learn from those who do. At Sperry Charleston Race Week, Quantum’s Ed Baird offered a number of off-the-water talks and informational sessions. There were also post-race dock and debriefing sessions led by Quantum pros designed to help all crews inprove. “Everyone is really willing to share information that will help you get to the next level,” says Hunter. A big fleet still only has one first place. If your primary goal is to stand on top of the podium, the Melges 24 and J/70 fleets may not offer the best opportunity. However if you’re looking for some fun and excitement, you’ve come to the right place. “You’re going to have good results and you’re going to have poor results, but any time you’re going 18 knots in a sailboat planning downwind it’s really difficult not to have a smile on your face,” says Hunter. Bonus! 9. Don't put the boat in a position the crew is not ready to handle. We got a good number nine from one of our Facebook fans, Jim Englert: "You are better off making the decision to take one or two sterns vs. dealing with the fallout of a boat handling mistake. Know what you can and cannot do. Take risks when there are large gaps behind you." While you always want to be pushing your team and getting better, know where the line is between growing and operating outside your team's skill set. Stay smart and safe! Be sure to check out this piecs spotlighting Corinthian teams topping pros at the 2016 Sperry Charleston Race Week.